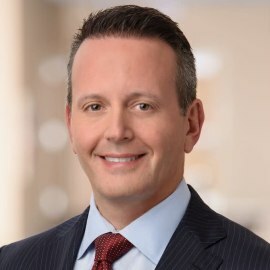 Brent Saunders is Chairman, President and Chief Executive Officer of Allergan plc. Mr. Saunders has served as a Director, CEO and President since July 2014. He was elected Chairman in 2016. Previously, he served as Chief Executive Officer and President of Forest Laboratories and as a Director of Forest since 2011. Mr. Saunders has significant healthcare industry expertise and a proven track-record leading business transformations and integrations. Prior to Forest, Mr. Saunders was Chief Executive Officer of Bausch + Lomb, a leading global eye health company, serving in this capacity from March 2010 until August 2013. Mr. Saunders also held several leadership positions at Schering-Plough, including the position of President of Global Consumer Health Care, and was named head of integration for the company’s merger with Merck & Co. and for Schering-Plough’s acquisition of Organon BioSciences. Before joining Schering-Plough, Mr. Saunders was a partner and head of Compliance Business Advisory at PricewaterhouseCoopers LLP. Prior to that, he was Chief Risk Officer at Coventry Health Care and Senior Vice President, Compliance, Legal and Regulatory at Home Care Corporation of America. Mr. Saunders began his career as Chief Compliance Officer for the Thomas Jefferson University Health System. Mr. Saunders serves on the Board of Directors of Cisco Systems and RWJBarnabas Health, and is a member of the Business Council and PhRMA. He is also the former Chairman of the New York chapter of the American Heart Association. Mr. Saunders earned his MBA from Temple University School of Business, his J.D. from Temple University School of Law and his bachelor’s degree from the University of Pittsburgh.